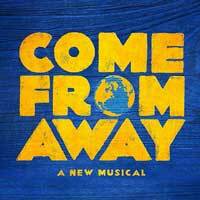 Broadway In Chicago announced the national tour of COME FROM AWAY, a new musical about the true story of the small town that welcomed the world, will make its Chicago debut at Broadway In Chicago's Cadillac Palace Theatre (151 W. Randolph) for a limited engagement July 30 through August 18, 2019. COME FROM AWAY will be part of Broadway In Chicago's upcoming season. Subscriptions will go on sale in the fall of 2018. The New York Times Critics' Pick takes you into the heart of the remarkable true story of 7,000 stranded passengers and the small town in Newfoundland that welcomed them. Cultures clashed and nerves ran high, but uneasiness turned into trust, music soared into the night, and gratitude grew into enduring friendships. On 9/11, the world stopped. On 9/12, their stories moved us all. Don't miss this breathtaking new musical written by Tony nominees Irene Sankoff and David Hein, and helmed by this year's Tony-winning Best Director, Christopher Ashley. Newsweek cheers, "It takes you to a place you never want to leave!"